PAM: Hi everyone, I am Pam Laricchia from livingjoyfully.ca and today I am here with Erika Davis-Pitre. Hi, Erika! Erika and her husband, Michael have four now-adult children. They have unschooled for many years and loved it. Erika continues to speak at unschooling conferences all over the US, her favourite topics being unschooling teens, the joy of unschooling, and celebrating diversity through unschooling. She is also an ATC fanatic, which are Artist Trading Cards, and if you have not heard of them, maybe do a quick online search and see if it is something that you or your children might like to play with, because I know we really had a lot of fun with them for a few years when the kids were younger. To get us started, Erika, can you share with us a bit about you and your family? ERIKA: Where to start? We have recently moved back to the west coast of the United States. We live in San Francisco, after living quite a few years in Connecticut. All of my children, who are adults now, also live on the west coast, so that is good—no more cross-country jaunts to visit. We have one daughter and three sons, and two son-in-laws, a daughter-in-law, an almost-daughter-in-law, and two grandchildren. The last two of my children were unschooled. The youngest of my children was unschooled his entire school-aged career, with the exception of second grade. If your child wants to go to school, as an unschooler, I highly recommend second grade, it is a good experience still. You get a real taste of schooling and it is not so soul-crushing that you have to do a lot of repair later. I do not know if there is anything else. I have been with my husband for more than half my life, and we are enjoying this phase of our lives; just being grandparents and having our kids spread their wings and doing all kinds of different things. That’s it for me. Can you go back then and share with us a bit about what your family’s move to unschooling looked like? ERIKA: Sure. My oldest three children are quite a bit older than my youngest—my oldest and youngest are about 14 years apart, so when my only daughter entered school, it was a completely different experience from when my son would have entered kindergarten. We started thinking there has to be another way. We did not know anything about unschooling, we were just going to “homeschool,” but homeschooling without a curriculum; just fun and playing and learning and just being. When we moved to Connecticut, my second youngest had just turned 14, and he wanted to experience learning without boundaries or borders, so for the first year we were in Connecticut, he unschooled. He had a great time, but was an athlete and in Connecticut, you cannot participate in high school sports without being in high school—they exclude homeschoolers in sports—so he decided that he was going to school because he wanted to participate in track and field and other sports, and that was when my youngest said he wanted to go to school too, because his older brother was going. We had three sons in the public schools in Connecticut, and it was an eye-opener to how much things had changed and how much different schools were than the democratic preschool that my older children had gone to, and so I said, “That’s it; I’m out.” I do not have the patience I once had to rally the troops and to be progressive for everybody else. I was just looking at the tender soul that I was in charge of and the last couple of years had been really good for him, and I saw a lot of change in personality, I saw a lot of change in how he wanted to be, and I just said, “No, we’ll go back to doing what we were doing.” It was successful and we are partners, and both of the partners have to be relatively happy with what they are doing and I was not. He was ok but not great—and we had been great—so we returned to greatness. That is how we got to be unschoolers. My two oldest always went to school. The third one we call our bi-schooler because he went to school, was unschooled, and then went to a traditional high school and college. And then the youngest only went to second grade for a full year of school, and has never looked back. He is not college educated; just working and writing and living his life, and is, I would say from the outside looking in, very happy with his choices at this point. That is how we came to unschooling. PAM: That is really interesting. Such a wide range of experiences and, in the end, you were basically looking to your relationships—that helped guide you as to what was going to work out well for each one of them. I often am asked if I would have unschooled my older children, if given the opportunity and my answer to that is yes and no. Yes, because of the opportunity afforded the youngers, but no because I really like the way they are now, and they would have been different had they been unschooled. The situation presented itself for the youngers and it did not for the elders and I am more leaning towards that it was the right choice for them because it was the situation that we had. So, circumstances changed, the relationships changed, the needs changed, and I just went with it. PAM: I think that is such a great point. Second guessing ourselves doesn’t help, does it? ERIKA: It only makes it harder to move forward in your path. ERIKA: I spend too much time second-guessing what is coming to think of the past. All foolish pursuits in my opinion. 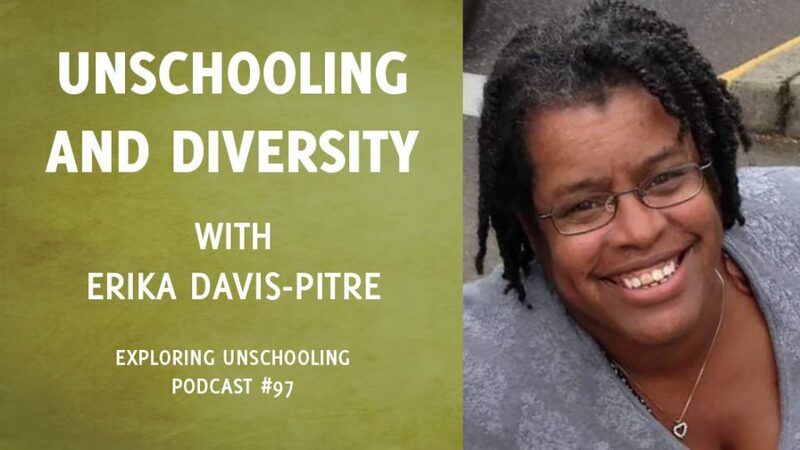 Earlier this year, I heard you speak at an unschooling conference about unschooling and diversity and I really enjoyed your talk. You shared some very enlightening stories about the subtle impact of privilege in our society and I was hoping you could share one with us here. For all of the years I have been speaking at unschooling conferences, the focus has been on increasing diversity amongst unschoolers but really, in society at large. Making sure that we are able to have conversations with people with diverse backgrounds and are not shocked when we encounter them, especially in unschooling communities and homeschooling communities where you self-select who you spend your time with—if you don’t like someone or they rub you the wrong way, as an unschooler or homeschooler you can just stop seeing them. You can just move away. And that doesn’t work, it just puts the bandage on the larger problem, which is how do I get along with someone who comes at situations in a different way than I do, is annoying, or is not satisfactory? How do I develop the skills to encourage them to see things from a different perspective? It is one of the little things that is missing when you live in a homogenous community and you do not have to deal with a lot of diversity, if you choose not to. And so, I would talk about how to encourage being out of your comfort zone and being out of the box. For many years, that worked really well for me. The last few years, especially with the political environment that came about with the election of Barack Obama and subsequent election of our current administration, I realized that just encouraging diversity was not enough, and so I started talking really directly about race and racism and how can we have these difficult conversations, particularly in all white, black, or Hispanic communities; when your community is by and large homogenous. When we have these conversations where we are seemingly unaffected by racism, how do we encourage our kids to have these types of conversation and see how privilege plays a huge role in how people are treated in our country? So that we are more inclined to participate in equity rather than to want a colour-blind society. I have seen a lot of well-meaning folk talk about not seeing colour, and that, in and of itself, I think is one of the most racist statements of all. If you do not see that I am African American or black, you are missing 90% of who I am, and why would you want to miss that? So that is the sheer sign that you need to do some work; if you do not want to see my colour, ask yourself why that is, because that where the bias is. There should not be any problem with you seeing that I am black, and if there is and you feel that the colour-blind answer is a correct one, ask yourself why that is. PAM: Yeah, I thought that was such a great point. And that leads nicely into our next question. As we move to unschooling, we learn the value of digging into our own fears and questioning conventional wisdom in many areas of our lives, like you are talking about not seeing colour, for example. For unschooling, one of the things we dig into is our fears around learning—that our children will not learn if we do not tell them what they need to know, or if we do not insist that they follow a certain time table. And through that process we eventually discover that we truly can trust them to learn, that they are born to learn, and after that our world opens up and we see so much more that was there. It was always there but we could never see it because we were so blinded by our fears. I was hoping that you could talk a bit about whether we can apply this same kind of process to our fears surrounding race and diversity? But the key difference I see is discernment. When we deal with race, we are constantly asking people to suspend discernment, as if that would solve the problem. Not recognizing difference. Not recognizing that brown people—people of colour—experience our culture differently. When we ask, especially young people, to not discern or tell them there is something wrong with that discernment; when we shy away from the colour-blind theory—do not discern, everybody is the same—it actually moves into the fact that their difference makes them richer. They add to my life, not take from it. So, don’t be ashamed to notice; but actually, notice and celebrate. So, it’s like the move towards unschooling; recognizing that things are learned without being taught. That all people and the inherent biases that we have going forward are from learned behaviour; no one is born a racist. No one is born biased. They learn them by gentle ways. We sometimes get wrapped up in the big “R” racism: the Klan, and the mobs, and the N word, and people making direct threats to people of colour. With that big “R” racism it’s pretty easy to pick a side; it’s the little “r” racism that we have got to tackle. It is the assumptions made based on skin colour, or based on culture, that we need to eradicate, and the only way to do that is to talk about how it looks to you. How does that brown person look to you? What is your first gut-instinct when you see someone of colour in certain situations? Because that is where the bias lives. If you make the assumption of criminality, if you make the assumption of better-than, if you make the assumption of worse-than, or less-than; that is where you need to start your excavation. In North America, we all live in a very racist, biased culture. We all swim in that soup and the only way to eradicate that is for everybody to recognize that it is structural—it is not even personal first, it is structural. We all make assumptions based on the structure of inequity and, in order to break it down, we have to see our hardship and our benefits of it. Even if you just have marginal benefits, if certain aspects of being are highlighted and celebrated, but then other aspects are denigrated, and you are made to feel ashamed. We have to unpack our racist knapsacks that we are all given living in this culture. We have to unpack it. And the default is racist, it is not NOT racist. The default is racist, the default is bias, the default is privilege. it is not neutral. If you do not do anything, it is not a neutral, you default to the biased, racist structure that this country and continent is founded on. You cannot get away from it by just saying, “I do not see colour and I see everyone as equal.” No, you have to unpack your sack. PAM: What came to mind when you were talking, because with unschooling we work through all of the biases against children, we start to see the structural nature of it; the conventional wisdom. But it even goes beyond that because it is built right into society as well, isn’t it? And to be open enough with yourself to ask yourself those questions and to acknowledge the fears and the innate actions and reactions that we have. To acknowledge those and take the time to work through them, that is where it is important, right? ERIKA: Yes, but it is very painful, because admitting that you are racist or that you are biased, does not feel good. Even in our constitution we are pursuing life and liberty and the pursuit of happiness. We have been given the charge to be happy. To be comfortable, to be celebrated. And this does the exact opposite. It does not feel comfortable. We are not being celebrated. For many people, we are being asked to take apart and to give up a piece of what is seemingly American, what is seemingly Canadian, what is seemingly Mexican; what we are given by virtue of being a part of this great society. You are asking a great deal of the population to set that aside and look for something else and that is uncomfortable. It does not feel good; it feels like a loss. If someone gains something, we have been taught that someone loses. We have not been taught in our society that there can be a win-win. We talk about it, but we really do not believe in it. We believe that if someone gains something then we are going to lose something. So, the first structural aspect of this that we have to dismantle is the win-lose. We have got to look for win-win, because when we are all lifted up and we are all comfortable, we all do better. But convincing someone who has that privilege to share it, is very much like us trying to make others understand that children are whole, complete beings. They do not need to grow into something, they deserve their wholeness just by being. People that traditionally parent, that traditionally see children as less, they think they are giving something up by giving children their autonomy and giving them their partnership in their own existence. They feel like something has got to be given up. Many unschoolers, myself included, have had talks with grandparents, letting them know that you are not losing anything by respecting his autonomy, by allowing him to speak for himself, by allowing him to have his feelings and emotions, not stymied because he is younger. And convincing them that they are not losing anything, that, as a matter of fact, they are gaining something in having someone that is treated respectfully. That person, nine times out of ten, is going to be a very respectful person to others, but if it has been ingrained in you that the only way to get this kind of person is this one kind of process, breaking down resistance is difficult. It is very difficult. PAM: I know, and that is such a great point, and it is that deep, isn’t it? It is that ingrained in us, and it can be such a big and powerful shift. ERIKA: Oh, yeah. It is very comfortable being the wise and all-powerful Oz. It is very curing when you finally get to the point when you are the person that is respected, that is looked upon greatly. I kind of use an analogy of the fraternity and sorority system and the hazing. Everyone always asks, “Why is there hazing? Why does someone who was so badly treated, treat others badly?” It is because they were badly treated; it is always possible to regenerate, to redo what was done to you. The hardest thing is saying “No; I know that was done to me, but it was not right. I may have survived it and come out of it ok, but it was not right, we need to change it.” That is a very difficult thing to do, particularly if you get the benefits from a structure of pain. We as a society benefit greatly as we age, and then it falls off when we are elderly; then we get treated like crap. But we benefit so greatly in those middle years that it is kind of hard to break that cycle of deprivation and pain and hurt; saying no one has to go through that to get to the good stuff; it is really difficult. But the reward is that we have a much more equitable and much happier and content society, but getting there, that is tough, because you are going to have to give up something. PAM: I love what you talked about earlier; it is a richer society right? Richer, deeper, wider; I like that. Speaking of, I am hoping you can share some ways we can be more welcoming to families from the wide variety of backgrounds that do exist in the unschooling community. ERIKA: Well, there are two things that I almost always say at conferences, and I almost always say it first. There is plenty right you can do to develop friendships and diverse activities; two or three things that you can absolutely fall on. I really would hope that, especially in the unschooling community, diversity is achieved by moving out of your comfort zone, your area, your neighborhood, and moving into someone else’s culture, comfort zone, neighborhood, for all kinds of art classes, library things, swimming things, opportunities for all kinds of cultural and community experiences. You can just leave your neighborhood and experience a writing class on the other side of town, a book club on the other side of town. If your actual town is not very diverse, there are plenty of ways to be welcoming, and that is by extending yourself and your discomfort level into another community and meeting friends that way. I think it is one of the best ways we as unschoolers have to widen our pallette, and it can ensure that we have diverse experiences. PAM: Yeah, I loved that point, about the impression that you are leaving with your children without saying anything, if your only focus is on charity. I thought that was such a great point, I had never thought of it that way and that was very cool when you shared that. The idea is to extend your community—go different places. That reminds me of when people talk about trying an activity, right whether it is karate or girl guides, or whatever, they always pick the closest one, just for convenience. Think bigger. I know with my kids, I have driven distances for many reasons; Girl Guides an hour away, because that group was a better fit. This is yet another reason why we do not need to keep our mindset so close geographically. There are so many great reasons to open ourselves up to all of the possibilities that may be an hour or two away. We have gone two hours away to things on a regular basis; it is a great reason for that. You have to look at it as a friendship. If you look at it as a friendship rather than an obligation, it is pretty easy to widen your pallet. If you look at it as an obligation to have your children have diverse experiences, you are going to resent it after awhile. If you look at it as a friendship, as giving your children more, as equipping them with more rather than less, the richness of the experience will win out. We are creatures of convenience and we like being around each other. When I say that, I mean that we like being around people that we know, people that make us feel comfortable, people that we can be unconscious around. It is a powerful myth that it is easy to be in a diverse community. It is not. It is constantly questioning what you know to be true. It is work to be in a diverse community. It is easier to be in a homogenous community where you think everyone feels the way that you do. You have social norms that you can conform to. That is easier. It is more difficult to think of someone that you have seemingly nothing in common with. How are they going to react to this? How are they going to feel about that? It takes a lot of emotional work to put yourself out there; it is not easier. It gets easier, but it is not easy. Just like unschooling, it gets easier. The first few years I was unschooling I did not know what it was called, and the need to have that workbook on the calendar and have it available on the bookshelf, have it available in the book bin, have it available in the trunk, have it available in the box, have it available in the garage. You see how it is moving, but it is all available because that is the way—I want availability, to me that is the representative of how we handle anything that is against our norm. We leave the option for normalcy as we move towards something else, we leave that option available. I wish and hope that we can do that same thing with diversity. We try on new things, we reject what does not feed our soul, and we take on what does, and we are constantly encouraging ourselves, saying, “Well, if that was not the right way to do it, there are other ways,” and continuing to do the work. The hardest part is doing the work. It is easy to leave that workbook on the table because it reassures you. It is harder for your kids, but it is easier for you. It gets easier again when you move it to the bookshelf, because that is easier for your partner or your child, and it shows that it does not have to be front and centre. Then it is far easier when it moves to the trunk, to the book bin. And it is far easier once it is moved to the box in the garage. I will tell you that it is far easier when it ends up at the Goodwill as a donation for someone else that needs that, because you do not need it anymore. But those phases might take years, they might take months, they may take weeks, they may take days, depending on the process and where you are in it. We have got to encourage diversity and diverse thoughts in the exact same way. Let people lead people to walking that walk themselves, helping them see that the walk is valuable, helping to see that we all benefit when we see diversity as a plus not as a chore. PAM: I love that image of moving the book further out, because that is something that I find myself talking about quite a bit in unschooling conversations: our comfort zones and the work to stretch our comfort zones. Well, you know, there is not an end to it, there is always more. ERIKA: Sure. And the hard part about increasing diversity is there is the expectation that there will be an end. When we elected Barack Obama, the talk of post-racial began almost immediately. “Oh, we’ve gotten to the point where this black guy can be president,” and it is like, that is not an end, that is the beginning. As a matter of fact, I submit to you that his being elected brought all the horror of America out into the open for the first time in 40 or 50 years. We had been very complacent in thinking that we had done our work and here is the black guy who is the result of our work. We are so much better than we were 40 or 50 years ago, and he is the proof. But, in actuality, he exposed that our work was far from done. We had made strides, but our work was far from done, and the folks that really felt his inferiority came out of the wood work. And it was not just the rednecks or poor people; it was proper society, it was the educated, the people that we had expected, because of their financial superiority to a lot of other people, have nothing to fear from this black man, and they said, “No, it is not him that we fear, it is losing our supremacy, losing our benefits of being always looked to to be in charge, and always looked to to be setting the norm, always looked to to lead.” And this, quite frankly, challenged that assertion. And so, I look at where we are as a society right now, and we are in one of the most pinnacle moments where we get to chose where to go. Unfortunately, it does not look like we are making good choices for a vast majority of the people who live in our society, we are making the choice that is recognizable, that does not take work. We are choosing to want it to be the “good old days,” which never existed. It was the “bad old days” for very many people. The comfort of knowing is being upheld over the discomfort of progress. PAM: That is a great point. And, as we are looking at the discomfort of progress, I was wondering if you could share some tips on approaching these kinds of challenging conversations around diversity with extended family members. If you come across a racist relative—because the holiday season is coming up and there is always one, there is always somebody that says something, especially in the United States with the controversy of taking that on during the holidays—ask a question, do not make a statement. When someone makes a racist joke around you, and normally you would just stay silent—angry, but silent, because you did not want to be THAT person that makes everyone else uncomfortable—ask yourself why you would want to be comfortable with that discomfort. Start asking questions instead of making statements. Stop declaring yourself other, and instead declare them included in your life, in a valuable way. So much so that you want them to be better, instead of leaving it as is. The hardest part I see is challenging the comfortable. It is challenging the uncle who is your favourite. Challenging the cousin or sister or mother or father who always gave you comfort, and always was put on a pedestal. See that that pedestal needs to be redefined and you need them to look up to the ideals that you have. Do not just walk away; if you are walking away, say why. “This is so inappropriate, I am so disappointed, I am walking away.” And make it personal; make “I” statements, not “we” statements. Own your disgust. If they said something disgusting, own it. And then walk away. If that is all you do, you plant a seed. People are thinking, because I guarantee you, unless you are in a wholly and completely racist family, three other people who are sitting there want to say and do what you did, and you are encouraging them, if for no other reason, to think. And if there are young people at the table, you are telling them what you want by your actions, so it is very important to ask questions and then make statements with action. If the statement is made without action, it is just words. If someone says something insufferable or intolerable, let them know it has no place with you. And always make the statement, do not just walk away, because people are learning all the time. PAM: Yes, and if you walk away without the statement, as you said, so often they will not even realize. You are planting that seed, right? I think that that seed planting is a great point because I do the same thing with anybody out and about, when the conversation turns to unschooling or whatever. Something that is so unconventional that makes other people uncomfortable, to be able to plant that seed so that they can talk. Because confrontation, when it escalates, there is not a lot of learning there, but when they have that seed, they can take that with them. It is planted for them to think about and process as they go through their days; that is when learning really happens. ERIKA: And there are times when confrontation is appropriate; don’t get me wrong. I am not saying walk away; plant a seed when something is wholly inappropriate, there will be times—and you know where those times exist. Everyone likes to make it seem like, “Oh, I wouldn’t know when…” Yeah, you know. You know when the time presents itself when you are supposed to speak up. If you are comfortable with someone being blind, with someone being treated less than, that comfort is your lesson. That is the lesson you are teaching with your actions. You know when it is time to say, “Oh no, you are not going to say that in front of me and get away with it.” I don’t care who it is. We have to be courageous in discomforting the comfortable. And nine times out of ten, the discomfort is felt by you. It is so easy to not confront, to not speak up. To walk away, thinking, “Oh, I felt so bad.” To write a Facebook post, or to send out an, “I am so sorry I was not able to say anything.” It is far too easy to do that, and if you are doing that on a regular basis or you find yourself making excuses for inaction, that is worth a reply. Do not worry about cousin so and so or uncle such and such; start the work with you. Why am I comfortable saying nothing? Why am I comfortable maintaining that kind of rancor? What do I fear will happen? And if the fear is isolation, if the fear is not belonging, if the fear is your wildest dreams—disinheritance, or whatever—if that is your fear, it is more about you than the person who is spouting the crap. It is more about you. It is not about them. Do your work first. Be that example to yourself. PAM: Yes, and that ties right back to what we were talking about at the beginning, about how much of this is our work—processing our fears. ERIKA: Absolutely. And it applies to many things; it applies to many relationships. The wariness about “isms,” is just never ends. Once your eyes are opened to an “ism” in this area, your eyes open to an “ism” in that area. You are constantly excavating our culture, our society’s isms. You know, from the time you are aware until the time you die, you are constantly unpacking the luggage of “ism,” because comfort is the most addicting feeling. We want to be comfortable and seen as nice, and to live a nice, comfortable existence. And so that drug of comfort is so powerful; especially when you are in a homogenous group. What makes the universal “us” comfortable? I know, not having to think about THAT, not having to think THAT, not having to deal with THAT. If it is not my issue, being able to avoid THAT. I do not want to see THAT. I do not want to have that uncomfortable conversation with my son when he happens upon a YouTube video of a man being shot in the back. I do not want to see the protest and be asked, “What is that all about?” and not be able to have a comprehensive answer that makes me look good, that makes me look progressive, that makes me look aware, that makes me look like I am a participant in justice, when actually I am not doing anything at all, except avoiding these tough conversations. It is all about comfort and our whole lives are spent comfortable, and then you are asking me to read about the person who brings the discomfort into my house? I do not think so; I do not think I am going to do that. Unless I am pushed up against the wall by saying the wall is there, it is on top of us. Particularly when it comes to race. The wall is on us, and the one thing that I correct whenever I see it online or at conferences, is the myth that the youth are so much more progressive, so much more positive, raised so differently. No. Every old racist was once young, and every young racist has a family that cares about them, has a community that cares about them, and has nurtured those thoughts, those ideas. We need to stop with the structure of believing it is only old people, it is only jaded people, it is only poor people, it is only rich people, it is only, only, only. It is us; it is every last one of us. Every person has the potential to be biased, to be angry, to be ugly. Everyone does, and we have to get over the “good people” syndrome, because it does not exist. Given a certain set of circumstances, people can do amazingly cruel and amazingly welcoming, beautiful things. The cruel vs. the welcoming beautiful; it is all up to us. Every moment, every chance we get, we need to recognize we are making choices based on what we came up with, what was acceptable in our society, what was acceptable in our culture. Any time I hear, “It is old people,” I say, “Charlottesville was full of college students in khakis. it was not old, and by your argument they are the most privileged, and they should be the most content, and they are not. Why is that?”Because that is the root; that is where we have to start working, otherwise we are just going to keep turning into old racists with power. They see the old racists with power, and think that is where it comes from. No. Any leader has followers. Anybody that you see that is totally biased, totally racist, and they are in a position of power? It is because someone has given them that power. We all have those moments where we can admonish or we can encourage what they are saying, and we can learn from how they are telling us what we are teaching them, because we are always learning and we are always teaching. It does not have to be books and academic subjects; we are always teaching what our culture means, all the time. Young, old, everybody. Always teaching what is important to us and what is not important to us. What we deem gracious and wonderful, what we deem outlandish and awful; we are always teaching. PAM: Those are such great points Erika, and, I mean, so many things swirled—back to our conversation about the problems with colour-blind and even with so often looking to our children before they have become so enculturated—they are such wonderful guides—and to be able to embrace and encourage those observations, as you said, rather than reacting from that place of fear again, right? ERIKA: Right. And also, where our children are not arbitrators of what is good, and why is that? It cannot always be those big statements when someone says something hated that you have to speak. It has to be the small moments of just the slightest bias, that you have to speak. Because then they start to recognize, “Oh! It is not just big, it starts very small, and it grows.” It starts with the three-year-old that says, “Why is that woman brown?” and rather than admonish, saying, “We don’t say that,” say, “Because her parents were.” Answering simply, with no inflection, with no thought, with nothing big, just answering the question. That is more for harmony and comfort than I could possibly tell you. So, I turned a moment that could have been a defining moment in his little life, his defining moment could have been really ugly, and I had turned it into something really positive. Not only for him, but for his mother. I wanted her to know it is not bad to be curious. It is when that curiosity leads you to believe something that is not true, but not the curiosity itself. So always correct the young children. He wanted to know why. He had a thought in his mind and he was willing to satisfy that. I could have gone any number of ways with it. I am so happy that I went the way I did, because that exchange left everybody smiling, instead of someone being horrified, someone being admonished, and someone feeling bad. We all have those opportunities where we can turn our lemons into lemonade, and that was one of mine. PAM: That is an awesome story, Erika; a great example of how we can approach these kinds of conversations. I like the way you described it, as just sharing truth. Just answer the questions truthfully. ERIKA: Yes, and not being afraid of being hurt answering the questions, because I think a lot of it is, “I want to have the right answer,” and there is no “right” answer, because the answer might make further questions, and we want to end that question because that question is uncomfortable. So, when we say, “Oh, why is she brown?” “Well, her parents are brown.” “Well, why are her parents brown?” it leads to a bigger story with bigger questions, and after that answer, “Why do you ask?” and then you get the answer that you need to keep going. We are so used to having final answers; being able to answer concretely. “You have this question, here is the answer.” Well, some of the questions do not have answers. They just lead to more questions. And we cannot be afraid of the more questions. Because the more questions challenge us in ways that make us uncomfortable. We are going to be uncomfortable and unfortunately, North Americans are really not good at being uncomfortable. They like big solutions, they like rapid response. They do not like to be reflective. We do not like to sit and say, “Hmmmm?” They like feeling good, most people do, but they want it to be quick. They do not look at the long term, and they are not encouraged, either socially or politically, or even morally; they are not asked to look at the long term, and we need to look at the long-term repercussions of our answers. And sometimes that means that at the moment you do not have an answer, so go find out; let’s find out why this is true. Let’s find out why that is. Always inquiring. Always learning. And it always comes back to the fact that we are always learning, there are no definitive answers to some of these questions. We are always learning. PAM: Always learning, yes, I love that. And that is a great place for us to wrap it up. It has been a wonderful conversation, I really appreciate you taking the time to speak with me Erika, thank you so much. ERIKA: Oh, I appreciate you asking me. This is my first podcast, I had no idea what to expect, and I appreciate you guiding me along and encouraging me to do this, because I do not think I would have, otherwise; always learning. PAM: That is wonderful, thank you so much. And before we go, where is the best place for people to connect with you online? ERIKA: Well I am on Facebook, Erika Davis-Pitre, that is pretty much where I am. And I am the moderator of the Unschooling Facebook group. We have great conversations and you are certainly welcome to come there. The queue to join is enormous because it takes so much time to vet everyone but if they want to contact me via Facebook, they can send me a personal, private message, saying, “I heard the podcast and I would love to join Unschooling,” and then that way I can move you out of the queue a little quicker and I always welcome conversation on my page. PAM: Thank you so much Erika, have a great day. ERIKA: Thank you, Pam, I appreciate this.